Benjamin Franklin was one of the Founding Fathers of the United States. A noted polymath, Franklin was a leading author, printer, political theorist, politician, postmaster, scientist, musician, inventor, satirist, civic activist, statesman, and diplomat. As a scientist, he was a major figure in the American Enlightenment and the history of physics for his discoveries and theories regarding electricity. He invented the lightning rod, bifocals, the Franklin stove, a carriage odometer, and the glass 'armonica'. He facilitated many civic organizations, including a fire department and a university. He played a major role in establishing the University of Pennsylvania and was elected the first president of the American Philosophical Society. An accomplished diplomat, he was widely admired among the French as American minister to Paris and was a major figure in the development of positive Franco-American relations. 8. Let not the sun look down and say, "inglorious, here he lies". Look below at his daily schedule and check it against yours. 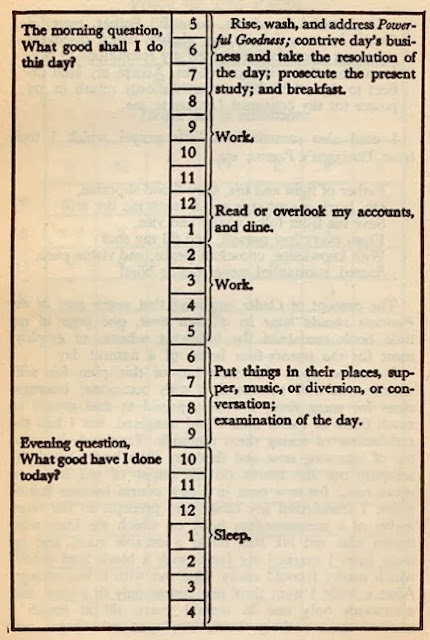 FREE Subscription - Click here to get articles like ' Benjamin Franklin's 9 Tips for Living a Productive Life ' in your Email.